Former Labour Deputy Leader Harriet Harman QC holds the record as the longest serving female MP in the House of Commons. After initially joining a House that was 97% male she was key in increasing the number of women in politics and establishing the first Parliamentary Labour Party Women’s Group. Her long service has seen her hold roles including Leader of the House of Commons, Lord Privy Seal, Minister for Women and Equality and Labour Party Chair. During the periods of change in Labour Party leadership Harriet has become the acting leader on two occasions and is the only politician to have ever held the position twice. She was the first Minister for Women, introduced the National Childcare Strategy, campaigning for longer maternity leave and higher maternity pay, the Equality Act, and changes in the law on domestic violence. In her role as Solicitor General she led a drive within Government to make tackling domestic violence a big priority. The campaign led to a new law – the Domestic Violence Crime and Victims Act and the introduction of a new team of specialist prosecutors for domestic violence and a new network of 60 specialist domestic violence courts. 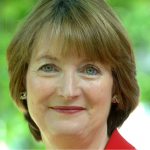 A wealth of political experience gathered at the heart of government means that Harriet Harman is supremely qualified to speak on how to effect change in society through Parliamentary action and innovative legislation.